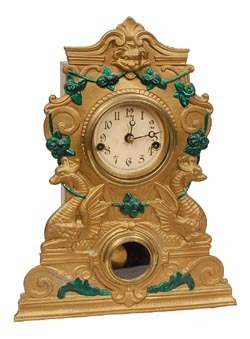 Waterbury Clock Co., Sales Room, New York City, reads the label inside this iron front clock. Iron case is signed, "N. Mueller No. 12". The metal case has sea monsters and a lions head imprinted. The one day movement is signed "Waterbury Clock Co. Conn." has been cleaned and put in excellent running condition. Strikes on a wire gong. A new paper dial has been added over the old pan. Both glasses are original and retain the white putty. The iron front is 15 inches high, has been repainted front and back. This is a nice example of the early Mueller iron front clocks.